BEFORE: Tying in very nicely with last night’s Seven Psychopaths, The Perfect Host is another crime comedy that appears to have a bizarre style. It will be very hard to top Seven Psychopaths but David Hyde Pierce, of Frasier fame, has the leading role so it shouldn’t be a horrible film. AFTER: As predicted, The Perfect Host was also very bizarre, however the execution was sorely lacking. The film jumps around between story lines in an unclear and confusing manner that leads to a lack of interest for most of the film. 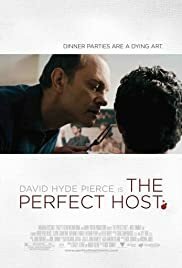 The Perfect Host centers around John Taylor (Clayne Crawford), a fugitive, and David Hyde Pierce (Warwick Wilson), a seemingly harmless civilian. The beginning has enough of a hook to get you interested in continuing watching the film, but it shortly fades away as scenes drag on and become tedious. A little ways in, things pick up for a short time when Warwick appears for the first time, but interest soon fades away until the very end. In the last twenty minutes or so is when everything makes sense for the first time. You understand what the flashbacks mean, who Warwick actually is, and there are at least two twists in a short amount of time. For the most part, the acting is pretty poor. Most of the scenes feature only Crawford and Pierce so the demand on those two is definitely high. It’s not the worst acting in the world, and there are moments where Crawford and Pierce shine, but the performances were below expectations and very disappointing. The Perfect Host is interesting to say the least. There are certainly good elements to the film but most are lost in the poor execution from the director Nick Tomnay. If you do decide to watch this film, you must watch until the end because it does redeem some of the worst parts.